That is to say, usage guides and recipes provided by refrigerator manufacturers. 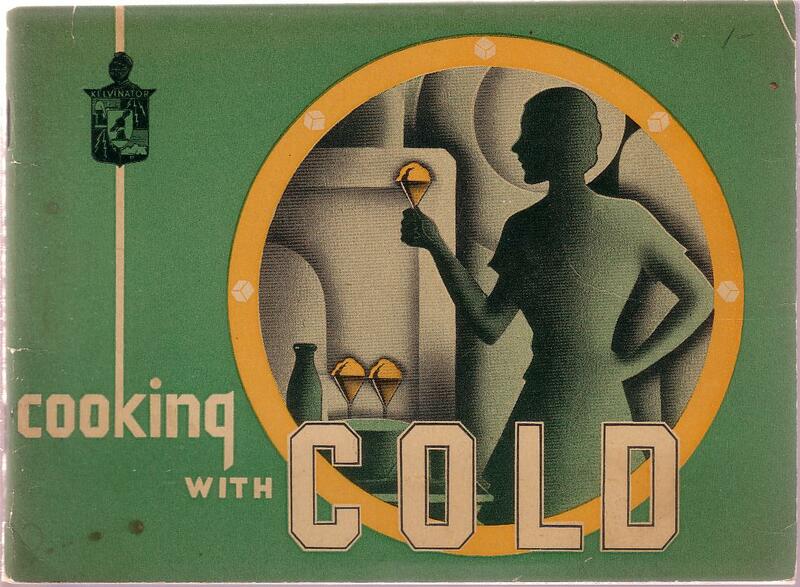 Our first item is from 1933: “Cooking With Cold” by the Kelvin Kitchen section of Kelvinator Sales Corporation of Detroit, Michigan. It’s a beautifully designed booklet in what must have been called the “Modern” style (notice the ice cubes in the yellow circle on the cover, here). 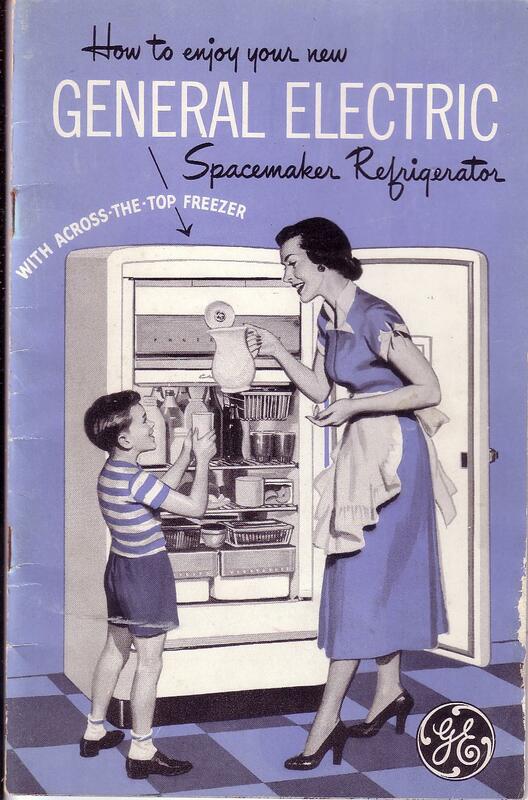 It includes instructions on how to store food in a refrigerator, as well as a two-page treatise on how the housewife’s quest “for equipment which will enable her to take care of the physical needs of her family in accordance with the ever-increasing knowledge and information which modern science is placing at her disposal,” and also save her time, is like a treasure hunt. The booklet contains additional sections on care and maintenance of the machine, useful advice on “cooking with cold” (such as the effect of sugar content on freezing time and quality), and “The Care and Use of Left-Overs” (“A few cents here, a few there … will soon make an appreciable difference in the family food bills.” I suspect this was included partly because the machine itself costs money to run!). Make a syrup of the sugar and water and one tablespoon of syrup drained from a jar of preserved ginger. When syrup spins a thread remove from range and pour slowly over the stiffly beaten egg whites and proceed as for Maple Parfait. [… continue beating until cool. Chill in Kelvinator, whip cream, and fold syrup and egg mixture into it.] Pile in Kelvinator tray and freeze. Makes 1 1/2 pints. 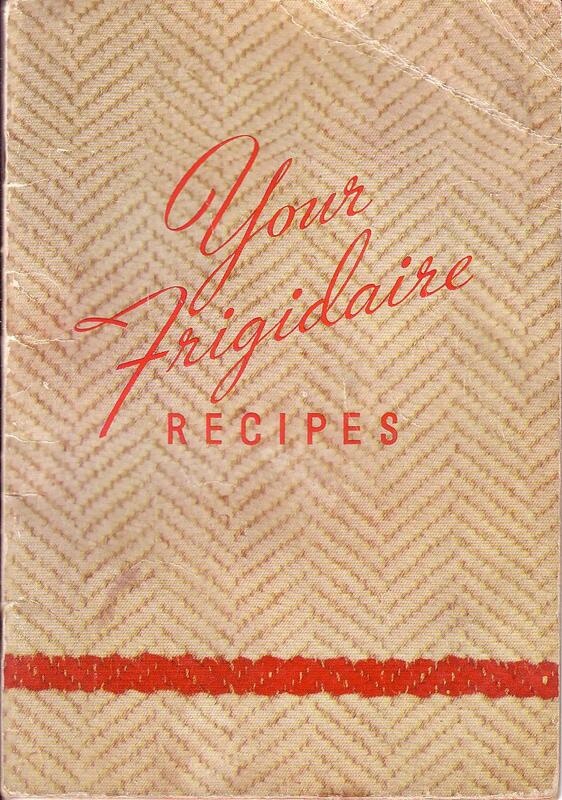 Our next item is from 1936 and the Frigidaire Division of General Motors Corporation of Dayton, Ohio, “Your Frigidaire Recipes.” I imagine the sweater theme of the cover was intended to invoke the idea of cold … not all of these companies were lucky in their graphic designers, as we’ve seen before. 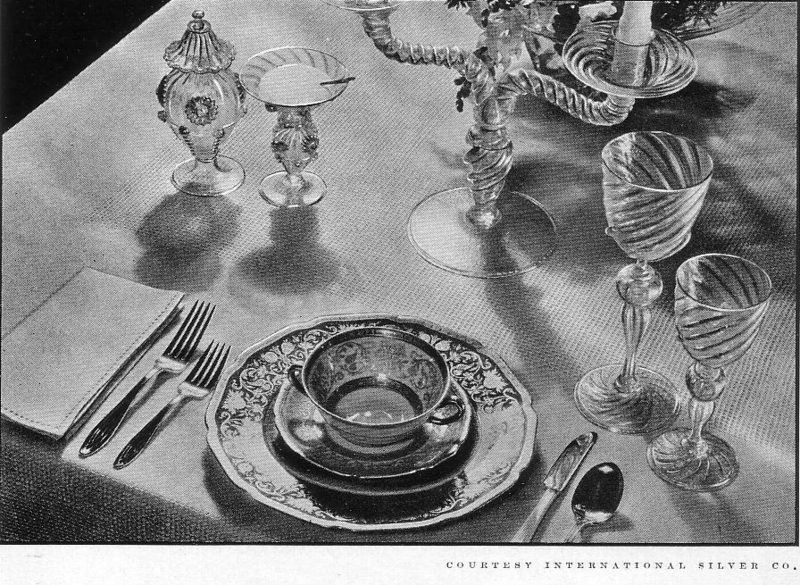 This booklet spends a lot less time on the details of the middle class lifestyle than many from this period. 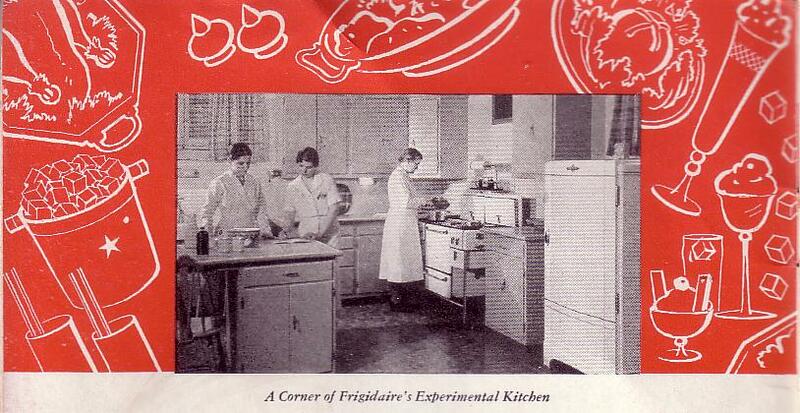 It talks about “Getting the most from your Frigidaire” and offers “140 Suggestions for Unused Portions,” and that’s about it except for the recipes and “Helpful Hints About Frozen Desserts.” This offers the useful information that “coffee cream” was a version of cream that contained 18% or 20% butterfat (whipping cream was supposed to have 28% butterfat but in different states it could go up to 40% butterfat, which was “too rich for a frozen dessert”). It also tells how to whip coffee cream and freeze the desserts. Break tuna fish and combine in a cold bowl with celery, horseradish, salt, and mayonnaise, using a fork. Arrange individual services on crisp lettuce. Garnish, if desired, with slices of hard-cooked eggs and a dash of paprika. I guess with the horseradish it wouldn’t need a lot of spices! Pour water over sugar and stir until sugar is dissolved. Chill in refrigerator. Combine orange juice and peppermint extract. Add chilled sugar sirup, blend. Pour mixture into 4 large glasses. Divide ice cream in 4 portions; add to orange mixture in glasses. Garnish with fresh mint leaves. Makes 4 large servings. Sounds tasty – too bad summer’s over and it’s too late to try it (at least up here in New England)! I also scanned this little section about refrigerator care, mainly for its illustration and for its blithe assumption that the reader would normally have two or three weeks’ vacation. Such a charming and dated idea, no?